Welcome to The Melting Pot, where friends meet over fondue pots at our party and event venue. 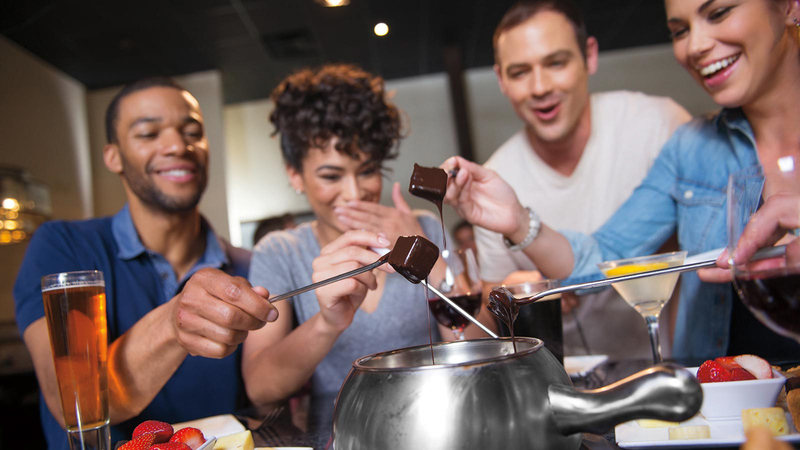 Imagine how much fun you and all of your friends could be having while sampling our delicious fondue. We offer a large variety of course options for any size group. Everyone loves cheese and chocolate, so make our party venue your next destination for fun and fondue. Artisan breads dipped in gourmet cheese followed by an array of desserts covered in your choice of chocolate- these delights and more await your taste buds at The Melting Pot. From the first bubbling pot of your choice of cheeses to that crisp bite of freshly made salad garnished with signature dressing, our full four-course meal is exactly what you need. You pick from a custom list of entrée seasoning options, and then finish everything off with your choice of chocolate fondue. No matter how many are in your party, they will love what we have to offer. or simply click below to print our Large Party Agreement or Large Party Menu. *Valid only Saturday, May 13 and Sunday, May 14. Priced and portioned per person. *MUST MENTION WHEN MAKING RESERVATION. Parties larger than 4, Mom Dream Package is priced at $37 for additional persons No sharing. Not valid with any other offer, discount, promo, certificate, bonus certificate or coupon. No substitutions. See store for additional details and restrictions. To order yours today, simply call 770-623-1290 to speak with our Hospitality Specialist!